Actually all of the coded themes of SKT Themes are based on HTML5 since from the start we have implemented HTML5 standards and our HTML5 based WordPress themes have facility of animations based on HTML5, gradients as per HTML5 and fancy parallax scrolling and others which are available only in HTML5 and not in other older versions. Todays technological websites rely heavily on HTML5 and it has replaced and outpaced several other techniques and usage of old programming like flash and has risen to the top to be used as the most preferred tool and way to develop modern websites which work across devices and platforms. Many things that happen in the front end nowadays seem fancy and useful and no one knows about the programming used in the backend. With the non use of flash in our websites it became evident that some other technology will find its way which is easier and cross browser compatible for users to have things fancy again on their websites and web apps and thus HTML5 was born. Many programmers nowadays hence keep on using these new methods and techniques to get better output in terms of visual interface and yet in the backend keeping things just like old days so that there is no surprises for backend and yet user gets something modern and unique and fancier in the front end. Many of them are based on HTML5, which is the newest hyper text markup language. This is another important point, as at present all the major and popular browsers provide HTML5 support, subsequently, this HTML new technology in the most productive way. Keep reading this article and you’ll find a bunch of HTML5 based WordPress themes, which for sure can be a supportive foundation for your website of any kind, description and purpose. We start with Clean Pro, which is a responsive, multipurpose, interactive and modern-designed HTML5 WordPress theme. Clean Pro can be a right selection for displaying any kind of content, and the dominant white space of the theme will keep the visitor’s attention on the target content and images. The theme comes with diverse elements and sections on the homepage, replaceable and changeable slider with 12 animation effects, widgetized sidebars, header and footer areas, manifold shortcodes availability and compatibility with popular devices and plugins. The second one in our list is Movers and Packers. This Google mobile friendly and cross device and browser compatible WordPress theme, just like the abovementioned one, suggests ready slider with 12 animation effects and pause time and other available features, widgetized sidebar, header with social media icons, footer, customizable background image and overall easy to use theme sections and options. This SEO and SMO friendly theme supports functionality with diverse popular plugins. And, of course, one of the advantages of the theme is its HTML5 and CSS3 compatibility. Another HTML 5 and CSS3 based WordPress theme, particularly suitable for any kind of business or corporate presentation, any type of agency, etc. 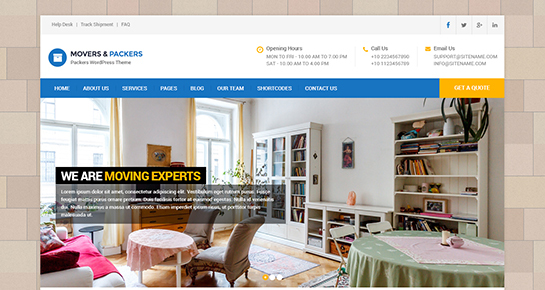 This responsive and all-inclusive theme with ist full package of elements and features is very easy in usage, and each user is able to customize and edit its website based on this theme with very little efforts. Design Agency Pro supports up to 5 levels dropdown navigation, widgetized sidebar, header and footer, easily customizable slider, social media icons, standard pages and background, text, colour and image change availability and many other options. The theme is checked with qTranslate X, WooCommerce, Contact form 7 and WordPress latest version. The next amongst the HTML5 based WordPress themes proposed by us, is Kraft. Thanks to its HTML coding, it’s very easy to integrate certain elements, like graphical content to your website without using additional plugins. This beautifully designed multipurpose theme includes default slider with possible 12 animation effects, complete documentation availability, 100+shortcodes and 600+ Google fonts, blog to be filled with relevant topics, articles and information, social media integration, color picker for changing the colors, image, background and text and conforms to WordPress latest version standards. Naturo is clean and minimal responsive theme based on HTML5 coding. This simple and convenient theme can be used to cover any kind of topics, as its simplicity in usage and appearance in this case work for the benefit of best website presentation with all the required information therein. Naturo comes with different useful sections on the homepage, including about us, portfolio, our team, large screen slider on the homepage, footer area with contact information and goes well with SEO, SMO and WordPress latest version norms. Blendit is graphically and functionally powerful HTML5 based WordPress theme, especially preferable for one-page theme enthusiasts. They can make the most of its theme and create and develop a successful and popular website of any nature. Blendit includes beautiful and effective slider on the top with diverse settings and options, 6+ page templates available, manifold shortcodes and 600+ Google fonts, available gallery, team, services sections and functionality with WooCommerce, Contact Form 7, SEO plugins and other popular WordPress plugins. Let’s go on with SKT White Pro – one of the most popular, preferred and beloved HTML5 based WordPress themes. This responsive theme is a mixture of elegant and eye-catching interface and great functional possibilities, which cooperating together, provide great user and visitor experience. The theme is presented with parallax slider with the availability of adding up to 10 slides, easy to edit menu and sections, lots of shortcodes available, standard pages, provides faster support using support forum and compatibility with WooCommerce, Contact Form 7 and the latest version of WordPress. Another minimalistic and easy to use one of the HTML5 based WordPress themes is Shudh. It’s another reliable framework, ready to serve you with all its possible features and options. Different sections and areas on the homepage, like portfolio, blog, our services and other can in the most relevant way display the required information and details. Shudh comes with totally controllable slider integration, 600+ Google fonts integration, 100+ shortcodes and is optimized for functioning well with many popular plugins. The last and not the least of the HTML5 based WordPress themes presented by us, is Toothy. As the name itself suggests, this responsive and professional looking theme can be used to create any dentist or tooth-related websites, covering any kind of relevant topics. Gallery section of the theme can display the photos of doctors, already performed works, different novelties and many more. Fully widgetized sidebar, header and footer areas, available 100+ shortcodes, 580+ icons and 600+ Google fonts are integrated within the theme. All the elements of the theme, text, image, color, background among them, can be easily and accordingly changed. Toothy is also praised for its compatibility with major popular WordPress plugins. The world is constantly shifting and the fact is that you need to go with the flow or get left behind; and when it comes to establishing an online presence, you cannot afford to do anything. You need to have an online presence to ensure that you capture your key demographics and more importantly, you need to revitalize your website and make sure that it’s running on HTML5 Based WordPress themes. For starters, WordPress is about the best platform there is that you can base your platform on and apart from the fact that it comes pre-loaded with several features, its CMS system makes it outstanding – enabling you to review, edit and upload in seconds which is much more than you can say about its competition. That’s why some of the top companies like CNN and Tech Crunch have opted to use WordPress for their websites. Of course, you can use several tools to gauge what your competition is up to and tweak and design your website accordingly. That’s the nifty thing about WordPress, you can tweak it, play with the overall layout and customize it within minutes and you do not even have to code anything. (not !) tag’ as HTML5 uses the same for the logo and other important features. The HTML protocol is the basic building block for the World Wide Web and it has already been through several iterations and HTML 5 is one of the latest and most powerful ones to come out yet. And choosing a theme that’s built on the same should provide your website with the much-needed boost. You can check out some of our layouts and themes and even do a demo; the whole point of doing a demo is that it enables you to check out the various layout features so that you can decide which one works for you best. You need to decide which layout and features work better for your business; after all, a website is supposed to help make it all easier and even though a website is not a magic pill, a well-designed website can be quite effective in getting you more traffic, prospective leads, and customers. So, go over our various HTML5 Based WordPress Themes and choose the one that looks to be a good fit. And always remember to check and see if the theme comes loaded with widgets that you can use to customize the site. Now, all that’s left is to get some good quality content up, and with it, you should be all set. When it comes to word press some of the themes are free but the premium ones, the sort that comes with extra features, may cost a little but check them out anyway. This entry was posted in wordpress themes on April 15, 2019 by SKT Posts Themes.